Halftone reproduction of a painting by Frank H. Taylor. This curious building was once a feature of South Broad Street standing at the corner of Locust Street. It was built by a firm of theatrical producers for the exhibition of a cyclorama called "Paris By Night", in the Centennial year of 1876. 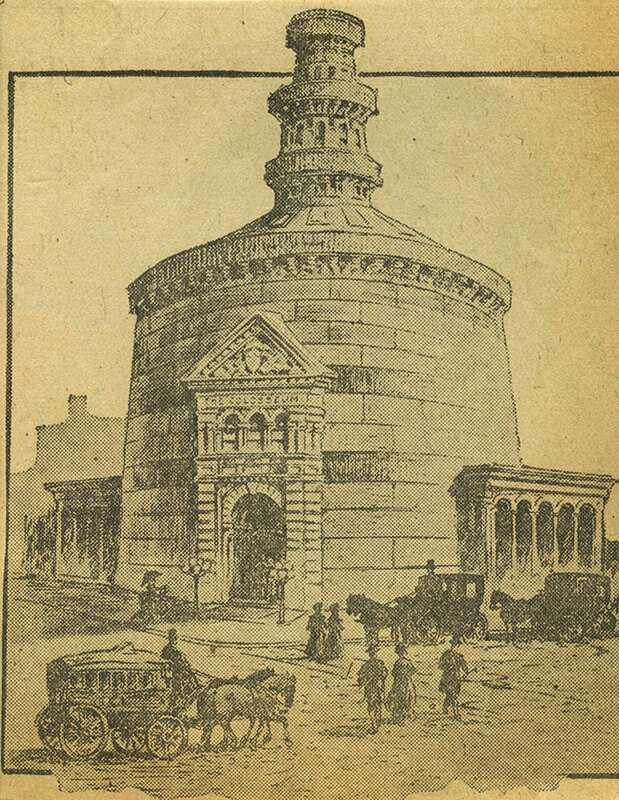 The circular building had a diameter of 129 feet. Made from corrugated iron, the outside measured 405 feet in circumference and stood 75 feet high. Inside was a large circular panoramic painting of the city of Paris, France, which when viewed from a raised central platform provided a convincing perspective image of the city. Higher up, the sky complete with stars, was painted on an extended canvas, adding to the illusion.